[Global] Kick off the new year with Duty Free Shoppers (DFS) Chinese New Year campaign. The Gamified Augmented Reality (AR) campaign is run simultaneously at 3 locations globally exposing shoppers to DFS’s international brand presence. 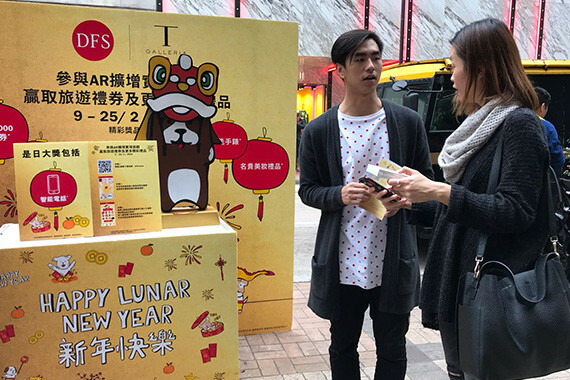 By installing Cherrypicks’ Starbeacon at DFS locations in Hong Kong, Sydney and Hawaii, shoppers are treated to an AR treasure hunt game to complete their stamp card. Shoppers can locate the lucky avatars on their map and Starbeacon will prompt an alert when the shoppers are in the proximity to pick up the coupon. Once shoppers have collected the entire collection of AR coupons, they are able to redeem a fantastic prize. The campaign has been localized for shoppers to use their preferred language to play the mini games.